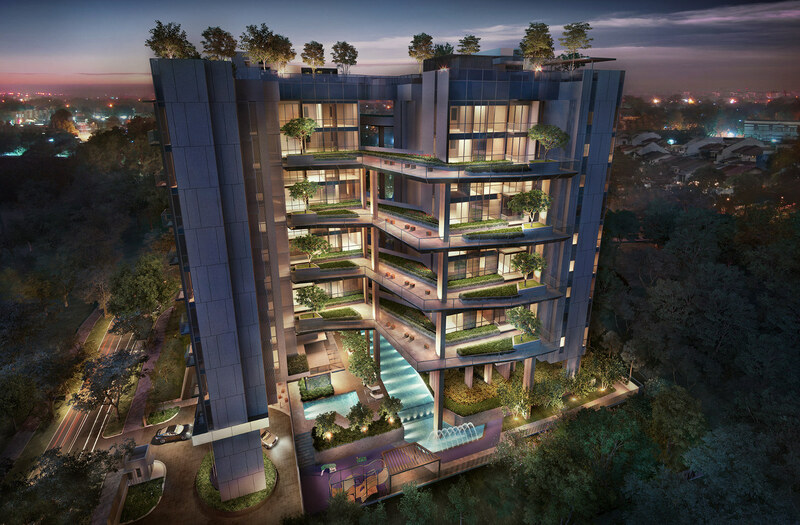 We present the Mont Botanik Residence condominium, a new freehold residential development along Jalan Remaja in the Upper Bukit Timah area. 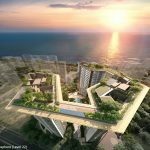 Tuan Sing Holdings will launch this for sale in the 2nd half of 2018. 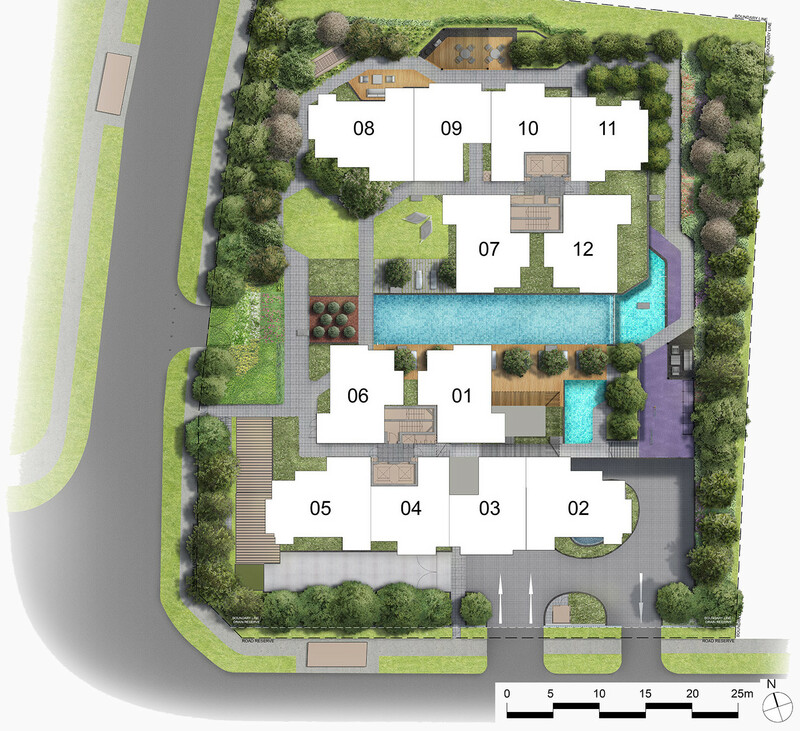 Our site is nestled within the quiet private residential enclave of Hillview, surrounded by nature reserves and parks. From Bukit Gombak’s “Little Guilin”, to the Bukit Batok Nature Park, and to Bukit Timah Nature Reserve that stretches all the way to Upper Pierce Reservoir. 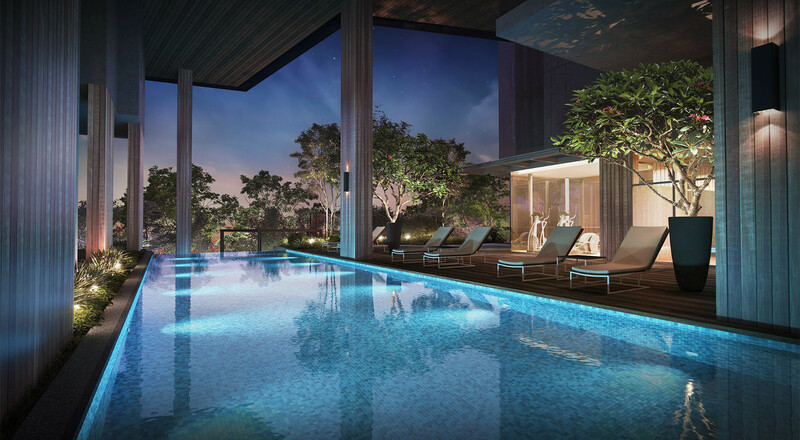 Mont Botanik Residences is designed for residents looking to escape the bustle and stresses of fast paced city life, to come home to a soothing oasis of greenery and tranquility. 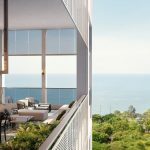 There will be 108 units in a mid-rise 10-storey high development, set against a backdrop of a landed housing estate on one side, and private condominiums on another, ringed by greenery in the distance. The design features two blocks linked together by a series of communal sky gardens, providing green relief for residences wherever possible. These friendly spaces encourage spontaneity and informal social gatherings. 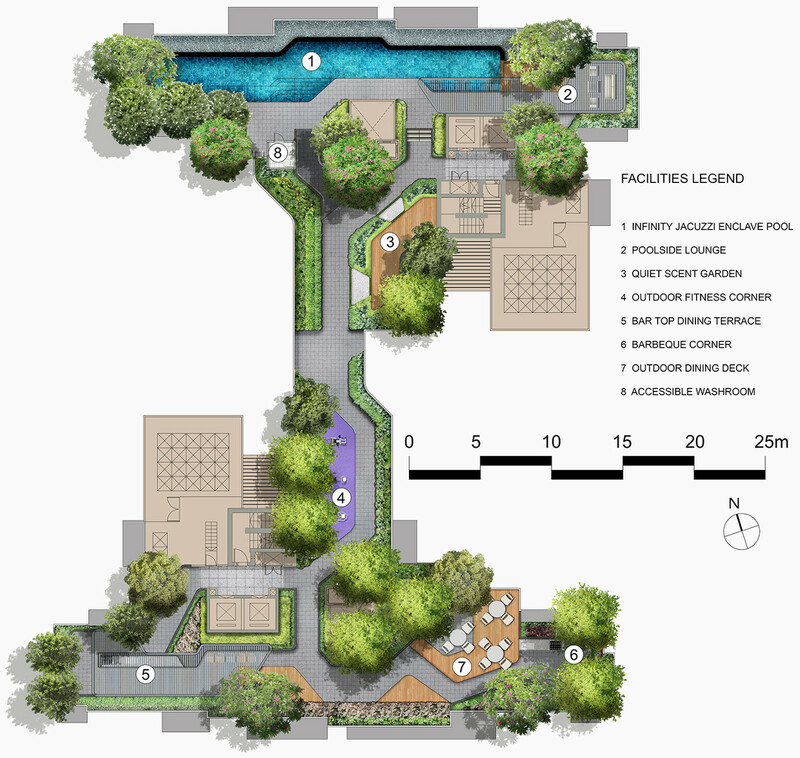 The formal drop off, landscaped with layers of trees and plants, welcomes residents and visitors, while the landscaped deck extending throughout the site at the first level draws them in. Please register via the Contact Form if you would like to be kept updated on the Mont Botanik Residence launch. Mont Botanik Residences will appeal to nature and outdoor lovers, situated as it is within walking or short cycling distance of these nature reserves and parks. 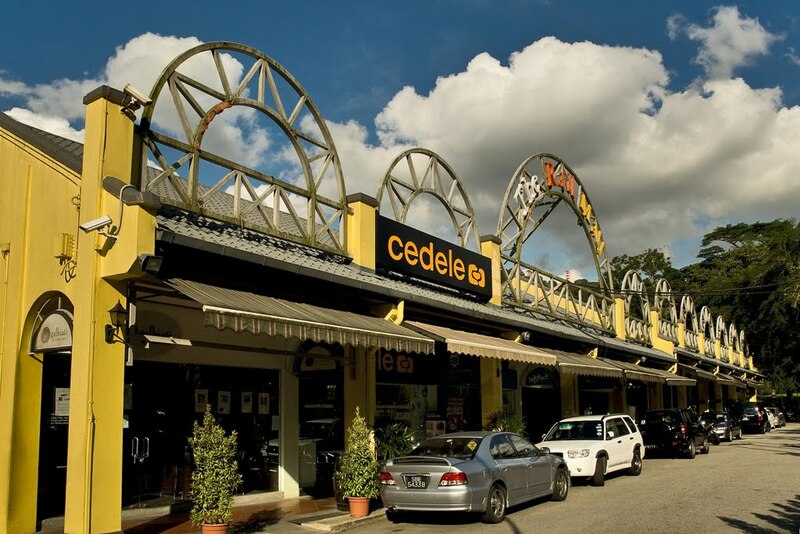 There is Bukit Timah Hill to be climbed, or the Dairy Farm Nature Park to be explored. But if you are more into leisurely retail therapy and catching up with friends over a cup of coffee, we have a perfect place for that 10 minutes walk down the road. The new HillV2, an upmarket retail and lifestyle mall at Hillview Rise, provides two levels of gourmet delights and lifestyle offerings. It offers a curated selection of dining options to indulge in, and retail shops and services. Like contemporary supermarket, Hillview Market Place for grocery shopping. Or famed New York gourmet grocer, Dean & DeLuca. Or Wine Connection Bistro for wine connoisseurs. The Mont Botanik condo floor plans are now available. Kindly register via the Contact Form if you would like us to send you the Mont Botanik floor plans. Kitchens for all types come with natural ventilation (windows) and can be enclosed. Another unusual feature is that all units are provided with gas stoves (even 2 bedroom units). All white goods provided in kitchens – SMEG appliances. Separate washer and dryer (SMEG) provided for all units (even for 2 bedders). Fully appointed bathrooms with fittings from Laufen / Roca; mixers from Hansgrohe. Approximate ceiling height of 3.2m for bedrooms and living / dining areas; 2.7m for kitchens and corridors; 2.4m for bathrooms. 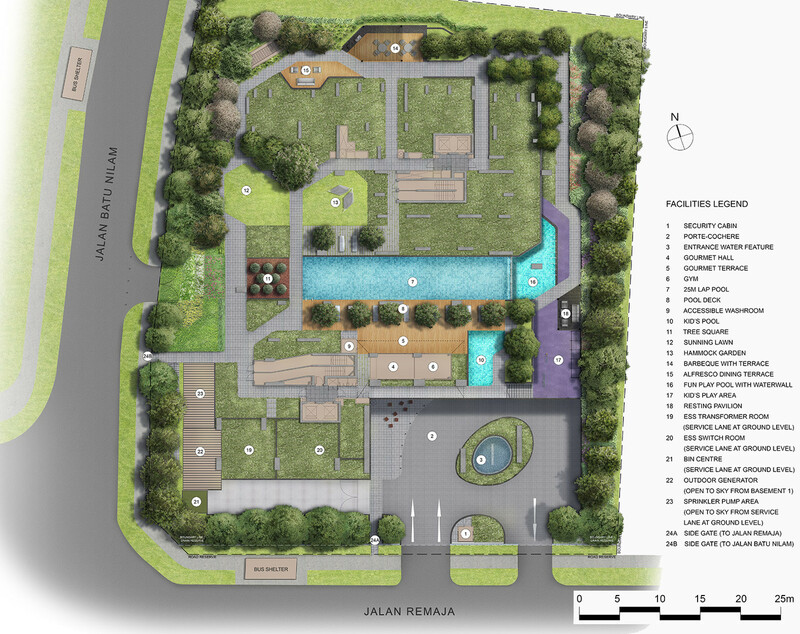 The Mont Botanik Singapore site is a roughly squarish parcel of land at the corner of Jalan Remaja and Jalan Batu Nilam. It sits within the private residential Hillview Estate, that is largely composed of a mix of landed houses and private condominiums. To the west and north-west of the Botanik condo site are the mainly 2-storey landed houses of Hillview Garden Estate. These straddle the quiet leafy lanes of Chu Lin Road, Jalan Gumilang, Jalan Dermawan, and along Jalan Remaja itself. 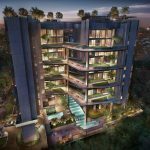 Mont Botanik Residence units facing this side should be able to get lovely open views all the way to the tree-covered Bukit Batok Town Park / Little Guilin. To the east and north-east of the site are Century Mansions and Hillbrooks condominium. But looking south-east, residents on higher floors will be able to get pretty good views of Bukit Batok Nature Park. 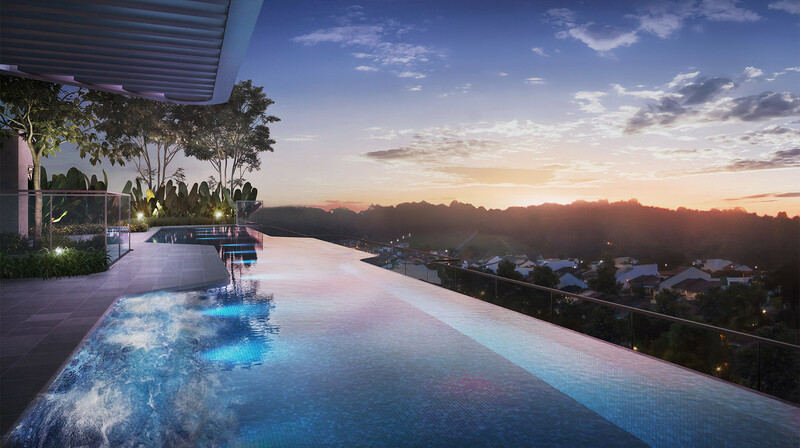 The Mont Botanik Residence site comprises 2 blocks of 10 storeys, with a basement carpark, a landscaped deck with pool and facilities, and sky terrace with infinity pool and dining decks and terraces. The blocks are elevated, with the lowest unit starting from the 2nd floor. This frees up the ground level for the landscaped deck to flow right through the entire site. 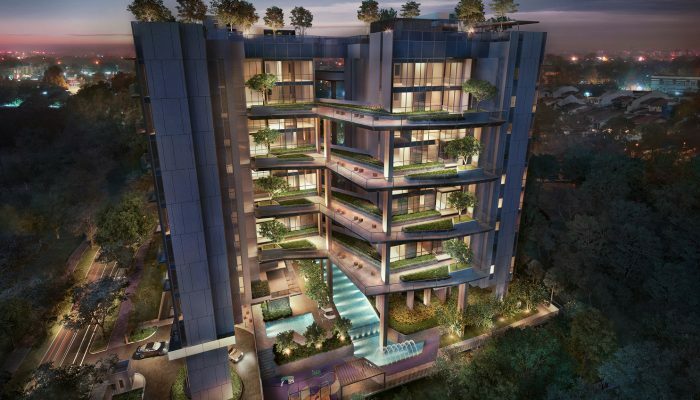 The Mont Botanik condo showflat is now taking viewing appointments. Please let us know via the Contact Form if you wish to book a viewing of the Mont Botanik showflat. Status as at 3 September 2018. See starting prices below. Please call us or drop us a line via the Contact Form below if you wish to know detailed Mont Botanik prices. 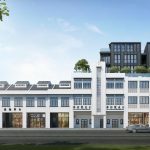 Tuan Sing Holdings’ wholly-owned Episcia Land acquired the freehold vacant parcel at 1 Jalan Remaja for SGD$47.8 million, from Andermatt Investments Pte Ltd on 11 April 2017. Development charges, to lift the value of the land, added another SGD$20 million plus to the cost of purchase. Based on the total cost of close to SGD$68 million, this works out to a land rate of around SGD$813 per square foot per plot ratio (PSF PPR) for the 43,557 sq ft Botanik condo site. After factoring in development, construction, overheads, and financing, the break even cost to Tuan Sing Holdings is around SGD$1,400 PSF PPR. 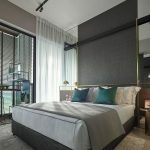 Mont Botanik Singapore is being developed by Tuan Sing Holdings Limited, an established local property and hotel group that was founded in 1969, and listed on the SGX Mainboard in 1973. 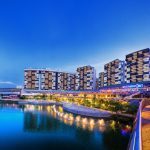 Tuan Sing Holdings is headquartered in Singapore, focused mainly in the business of property development, and property and hotel investment. 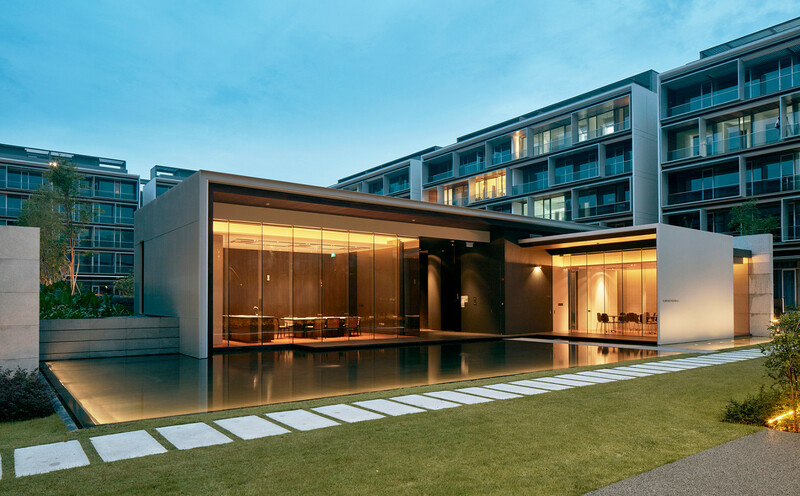 The Group has more than 60 subsidiaries across South East Asia, Australia, and China, with a diversified property portfolio that includes strategically located 5-star hotel properties in Australia. 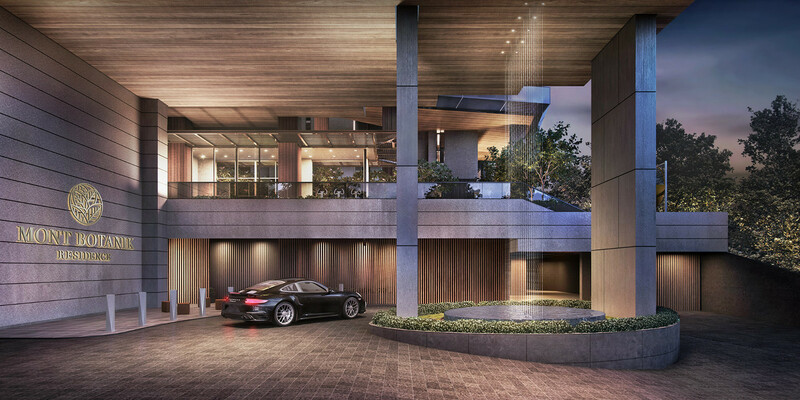 Tuan Sing seeks to deliver iconic and inspiring quality developments. This ability has been demonstrated with a track record of producing award-winning projects with exciting yet liveable architectural designs. Examples of completed local projects include Leedon Park (GCB), Seletar Park Residence (Architecture Multiple Residence for Singapore, Asia Pacific Award), Mont Timah (Green Mark Gold Award from BCA), Botanika (Award-Winning Architectural Design), Cluny Park Residence, Sennett Residence, Adam Park, The Oxley, and Robinson Point. Location. 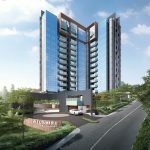 The Mont Botanik condo location is in the residential enclave of Hillview Estate, off Upper Bukit Timah Road, and across it from the Bukit Timah Nature Reserve and Hill. This is very much a private residential neighbourhood, surrounded by low-rise landed houses along sleepy tree lined roads, and a number of mid-rise condominiums and apartments that have been around for some time. There is a quiet sense of community and calm here that is soothing and relaxing. Shops, Food, Supermarkets, Services. The upscale HillV2 mall, about 10 minutes walk away with a good mix of cafes, bistros, restaurants, is a popular hang-out for residents here. With its sense of spaciousness, there is a relaxed vibe to it in keeping with its locality. Considering that it is not a very big mall, it has just about everything you need in the way of eating out and services. Even some fine dining options: Chinese, Korean, Italian, Japanese, Indian, and local. Or chill out with friends at Starbucks, or one of the two bistros or ice cream creameries. And for groceries and other essentials, there is Hillview Market Place gourmet supermarket, a clinic, dentist, hair & beauty joints, pet shop. A free shuttle bus service provided by HillV2 plies the estate, looping between Pavilion Estate and HillV2, with a stop along Hillview Avenue close to the Mont Botanik location. If you want a change, there is the quirky Rail Mall across Bukit Timah Road from the MRT station, with a number of F&B options and a few shops. For a quick bite or a loaf of bread or some other small need, we have a 7-Eleven in a row of shophouses, a couple of minutes walk around the corner at Chu Lin Road. Leisure / Outdoor Pursuits. Having those parks & nature reserves round the Mont Botanik location should make for a healthier lifestyle. There are so many walking and cycling trails within easy reach, besides the fresher air from all that greenery. It has also been measured that air temperatures around nature reserves are a good 2 degrees lower than in more built up areas. And even if you are not into anything too strenuous, this is also a nice neighbourhood around which to take an after dinner stroll, or to walk the dog. Nearest MRT Station. 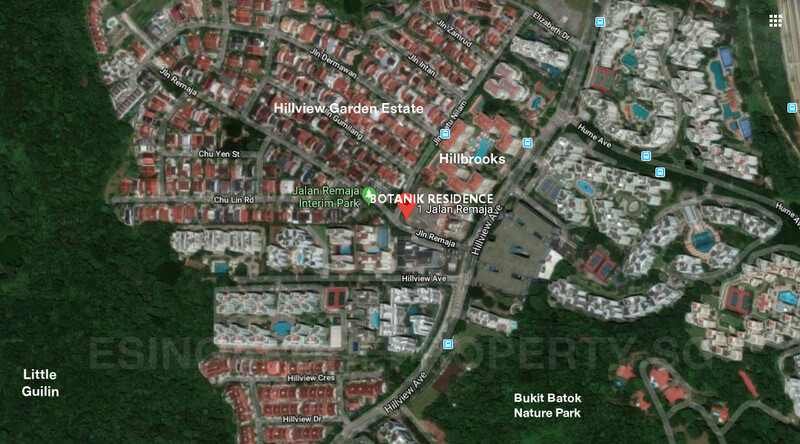 The Mont Botanik condo location is around 980m, or 15 minutes walk, to Hillview MRT station on the Downtown Line. This line goes past Newton and Marina Bay. It also passes the Bukit Timah Road education belt, along which are strung highly regarded schools like Methodist Girls, Raffles Girls, Nanyang Girls High, National Junior College, Hwa Chong Institution, NUS (Bukit Timah Campus), and Anglo-Chinese School. Accessibility. 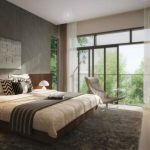 From the Mont Botanik Residence location, a 5-minute drive down Hillview Road, and along Dairy Farm Road, will bring you onto the Bukit Timah Expressway. From there you can either join the PIE (Pan-Island Expressway) southwards, or go up north to join the SLE (Seletar Expressway) or the Causeway.